To maximise those enjoyable life experiences. However, the number of falls in Ireland can be reduced by increasing awareness of falls risks. This is where Falls Action will help by improving the accuracy in assessing falls risk and mobility, resulting in more targeted “best in class” clinical interventions. Falls Screen is the first step in preventing falls and we focus on assessing, prescribing and action. Our Falls Screen using wireless sensor technology enables our Chartered Physiotherapists to deliver an accurate falls risk assessment to be undertaken in the home or community. The Falls Screen will assess the risk of a fall occurring. Improved identification of mobility impairment and those at risk of falls can result in targeting interventions, preventive measures and care services towards those at highest risk. At Falls Action, we believe that this approach will improve healthcare utilisation, reduce costs and improve quality of life in older adults. We will provide all our patients with a take home sheet with simple tips and advice on how to avoid having a fall and reducing your risk of having one. To screen you, we will fit you with the Kinesis QTUG™ sensors and take you through a simple walking exercise. It will take no more than 15 minutes. We use the clinical assessment & the QTUG™ sensor data to assess risk with a high degree of accuracy. Depending on the results of the Falls Screen, we'll explain what you need to do to minimise your risk. A natural consequence of ageing is that our balance can begin to deteriorate as we lose muscle strength and tone. No matter what your risk of falling, exercise is one of the most effective ways to decrease your risk of falling. Regular exercise will lead to stronger muscles, better balance and improved ability and mobility. Patients that have been identified as medium risk of having a fall will be recommended “best in class” exercises (based on the Otago Falls prevention programme), individually or as part of a group class, to improve balance. If you have a local class that you already attend, we will send them our specific recommendations based on the report from your Falls Screen. The biggest effect on decreasing falls rates is Chartered Physiotherapy. Patients that have been identified as high risk of having a fall will be referred to one on one chartered physiotherapist for a schedule of rehabilitation treatments. The Chartered Physiotherapist will work specifically with patients who have an identifiable and correctable gait disorder or mobility problem. The treatment programme will be regularly monitored and progressed to encourage ongoing compliance. We can help those that have had falls in the past and are still at risk to rehabilitate correctly and improve their mobility. If you have a local chartered physiotherapist that you already use, we will send them our specific recommendations based on the report from your Falls Screen. Patients who have been identified as having a medium or high risk of a fall, should go through our Falls Safe home assessment. We can advise on sensible (no cost or limited cost) changes to your home that can make a significant difference to the risk of falls. Our Falls Safe home hazard assessment is provided by one of our team of Occupational therapists who review floors, furniture, bathrooms, storage, stairs, steps and other mobility factors to offer professional advice. Our Occupational Therapists will also recommend what fittings for aided assistance such as bath rails, non-slip mats, chair lifts or other aided utilities may be needed. Should this be required, we will advise on how to obtain appropriate aids and appliances by the Health Service Executive (HSE) or certifying eligibility for the disabled person's grant. For those who are high risk, we will recommend and we can provide the only 24/7 medical monitoring service in the unfortunate event of a fall. 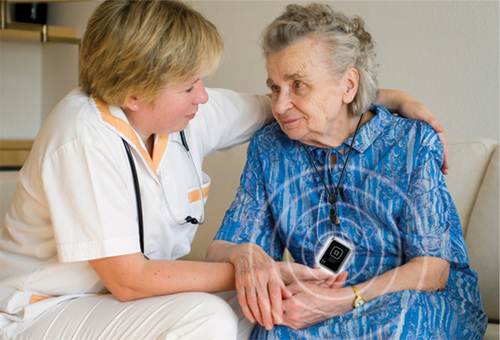 Our personal emergency response system is alerted to any falls. Our small pendant which can be worn around the neck allows for two way voice communication and alerts with accurate GPS location as to your whereabouts. The wearable device offers a fall alarm to our monitoring team in the case of an emergency. We employ LocationNow which offers a Complete Web Based Tracking Solution using GPS and Wireless Communications, allowing an easy and quick location tracking. Everything we do aims to reduce the risk of falls, but Falls Monitoring 24/7 provides peace of mind for you and your loved ones, just in case. Dublin, Ireland, 19 February 2015, Falls Action (www.falls.ie), which provides a comprehensive and objective falls prevention service, today announced the opening of three Falls Action Centres of Excellence in Dublin and in Limerick. Our clinical director, Anne McGoldrick speaks to Dublin South FM about Falls Action. Listen to Anne now explain why this is needed and how Falls Action can help you or those close to you that may be at risk of having a fall. Spectrum Health, Ireland’s largest allied health services provider and Kinesis Health Technologies Ltd a University College Dublin (UCD) spin-out company, today announced a partnership to deliver a comprehensive falls prevention service in Ireland aimed at reducing incidences of falls in older adults.